How to setup a VPN tunnel between two D-Link DI-824VUP? Step 2: Select the Home tab and click VPN on the left side. 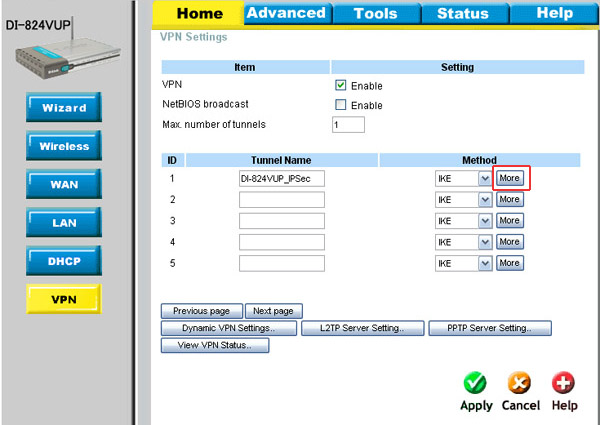 ID 1: enter a name to identify the VPN tunnel under Tunnel Name and select IKE under Method. 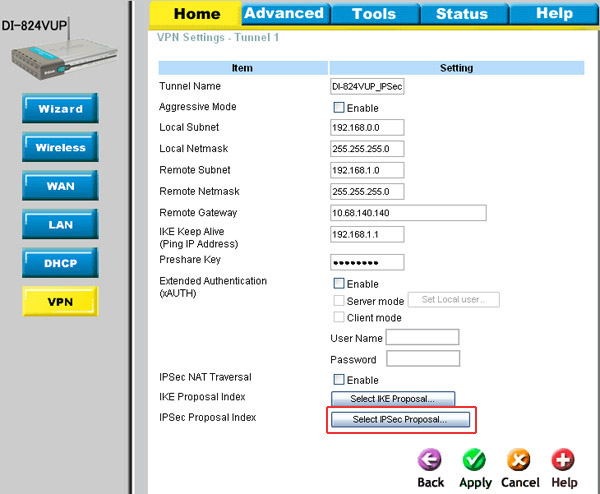 Step 4: Select Home and click on VPN to go back to the previous page and select More next to Method. 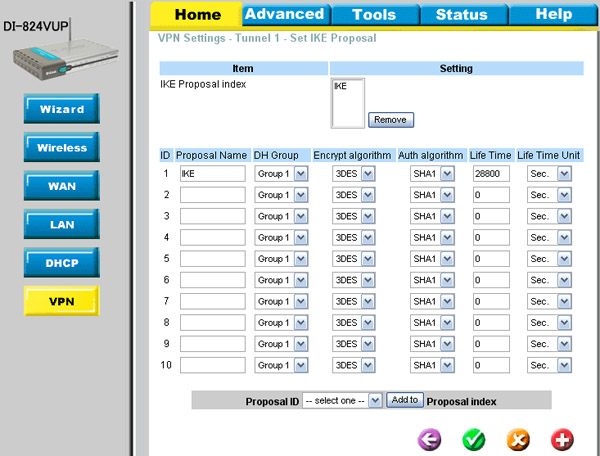 Step 6: Select Home, VPN, More and click on Select IKE Proposal. Life Time Unit: select Sec. Proposal ID: use the dropdown list and select 1 and click Add to so that the name of the proposal appears in the IKE Proposal index. 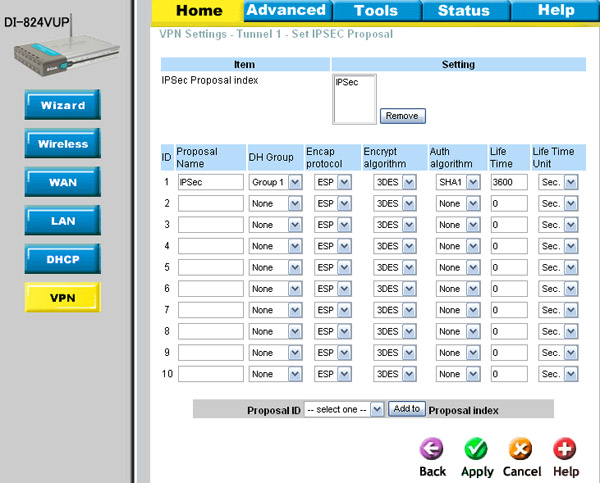 Step 8: Select Home, VPN, More and click on Select IPSec Proposal. Proposal ID: use the dropdown list and select 1 and click Add to so that the name of the proposal appears in the IPSec Proposal index. 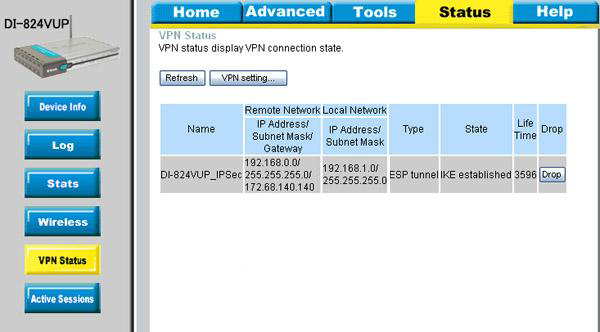 Step 10: Select the Status tab and click on VPN Status. Click Refresh if the tunnel has not established. How to configure an IPSec VPN tunnel between two D-Link DIR-130/330? 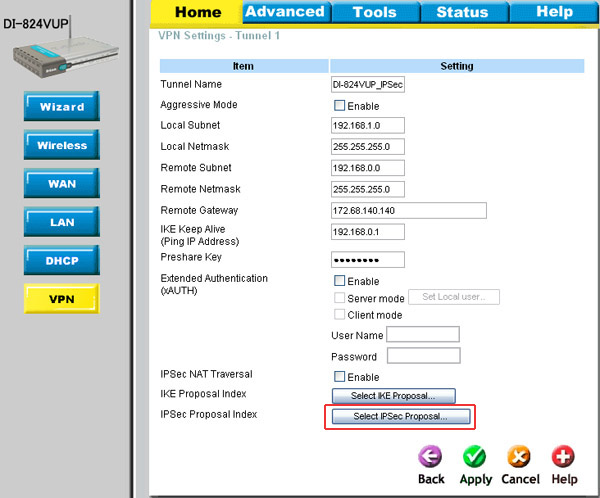 How to configure an IPSec VPN tunnel between two D-Link DI-LB604? How to configure Mac OS X computer to connect to a L2TP over IPsec Tunnel on D-Link DFL Series Firewall? 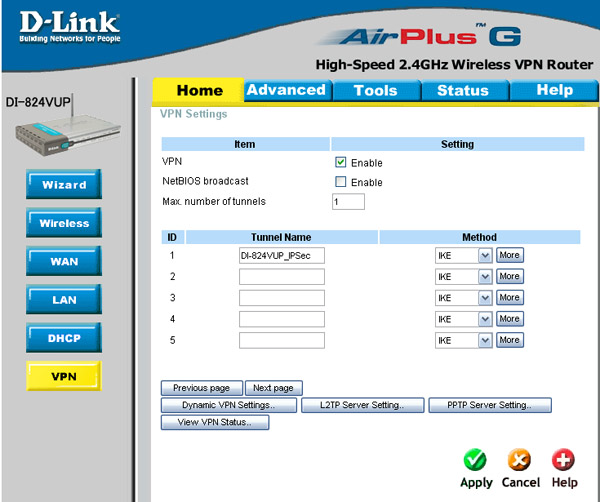 How to configure the D-Link DWL-900AP+ to be a Wireless Client to the DI-614+?